The George S. and Dolores Doré Eccles Theater is an exciting new performing arts center on Main Street in the heart of downtown Salt Lake City. Designed by world-renowned architect Cesar Pelli, of Pelli-Clarke-Pelli Architects, the theater, featuring a grand six-story lobby with dramatic retractable glass walls, will be a beacon of light and energy on Main Street. 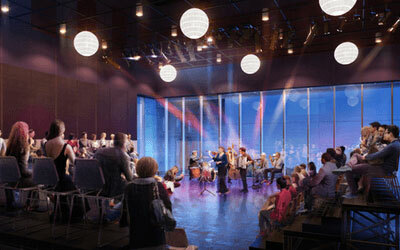 The Eccles Theater promises to be a hub of activity year-round with indoor and outdoor entertainment spaces. 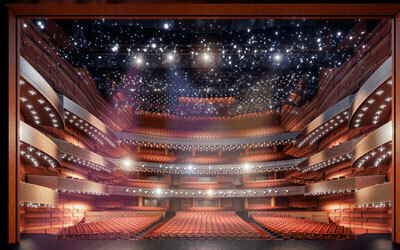 The 2,500-seat theater will host national touring Broadway, concerts, comedy and other popular entertainment events. Light savory snacks, gourmet candies, baked goods, beverages and a selection of craft and domestic beers. 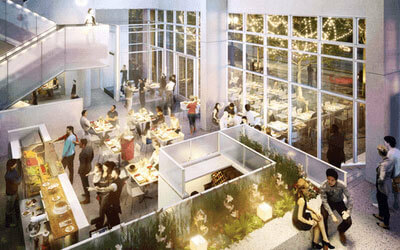 The Black Box Theater will feature 16-foot tall glass windows overlooking the new Regent Street Plaza. The Black Box ticketing windows and lobby will be accessed from Regent Street, creating a distinct experience from the main performance hall. Acoustically isolated, the 2,400-square-foot, Black Box space will be able to accommodate a variety of dance, music and theatrical productions as well as private, corporate and community events. Movable seating platforms will allow the room to be configured for several types of occasions, accommodating between 150-250 people depending on the arrangement.